The Kentucky Auction Academy is the Premier Auction School in Kentucky. 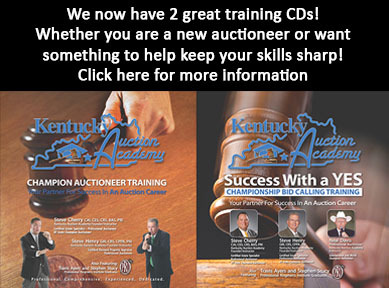 We are the Auction School of Champions with multiple Kentucky State Champion Bid Callers as Instructors. 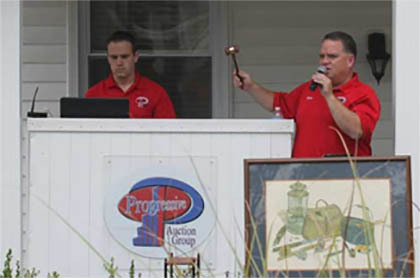 The founders Steve Cherry and Steve Henry have dedicated themselves to the instruction and promotion of the Auction Industry. The Kentucky Auction Academy, located in beautiful Bowling Green, KY will provide the student with the best hands on training necessary to perform as a professional auctioneer. The Academy offers eighty (80) hours of instruction and teaches the diversified skills designed to prepare the Auctioneer for immediate success. The 80 hour course is designed to teach students the skills and abilities essential in performing as an Auctioneer. This course is an in person course taught in Bowling Green, KY. If you need to take your CE / Core class, you can now do it ONLINE! There are also in person CE / CORE classes. Then The Kentucky Auction Academy is the place for you! *Georgia, Indiana and Ohio students will have an additional 2 days, making this a 10 day course.